The Southern Treasures of the Plant Kingdom. Since I have moved this year I do not have the chance to visit some gardens as much as I used to, this week I went and investigate a few of my favorites. I went to check the plants in them and see if anything had changed, as you know gardens are always a work in progress. I was pleased with the progress, the plants, new and old looked healthy, new features were being added and old ones were being featured more prominently. One plant I wanted to check up on was a huge Eucryphia which grows there. It was just as spectacular as I remebered it to be. Eucryphia, what ever the species or form are spectacular late summer blooming shrubs and small trees. Eucryphias are a genus that come from the very southern areas of the world. There are said to be 7 species with 5 from the east coast of Australia(and Tasmania) and the remaining 2 from southern central Chile and Argentina. 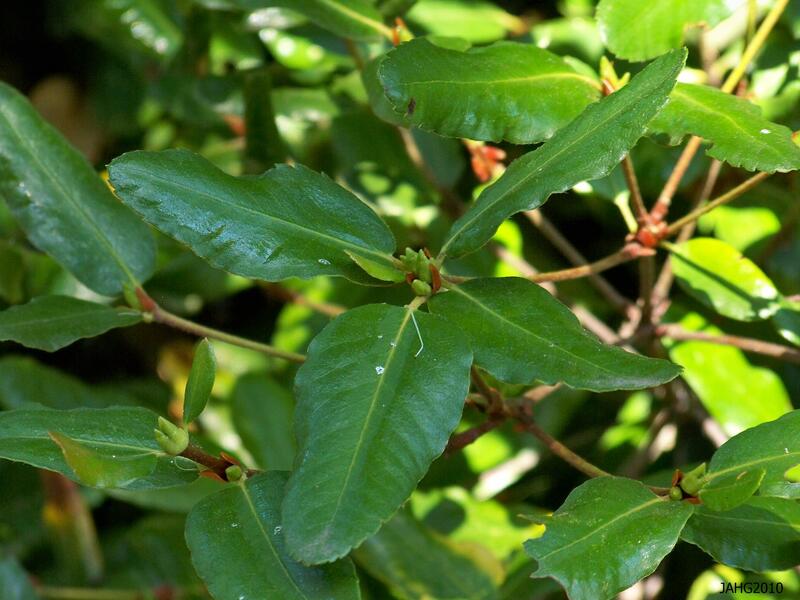 In their native habitat they generally grow to be large shrubs or small trees which are evergreen. They are now classified as being part of the Cunoniaceae family. The first Eucryphia known were glutinosa and cordifolia from South America and are now considered to be threatened there. 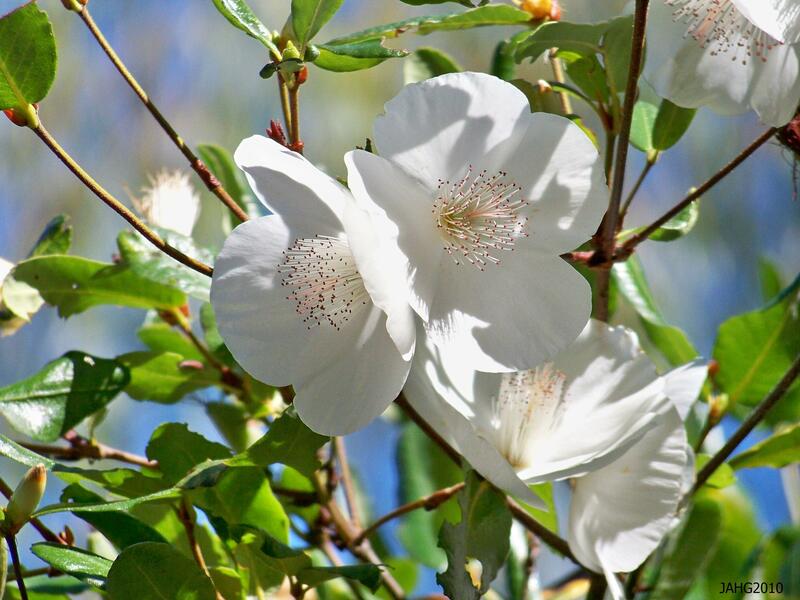 Eucryphia cordifolia was introduced in 1851 and later in 1859 glutinosa was collected for Veitch Nursery in England. This Eucryphia x intermedia 'Rostrevor' is found by the the famous 'Stone Bridge' which crosses Goodacre Lake in Beacon Hill Park in Victoria. The most famous Eucryphias are crosses. Eucryphia x nymanensis was a chance seedling which was found at Nymans, a famous garden which is now part of the National Trust gardens of Great Britain. This seedling was discovered in 1914 in the gardens and is a hybrid between the 2 Chilean species glutinosa and cordifolia. Another seedling(same cross) also was found at Mount Usher in County Wiklow in Ireland. It combines the best feature of the parents and is considered to be the hardiest of all Eucryphias. It was given an AGM in 1924. These plants are collectively called Eucryphia x nymanensis ‘Nymansay’. 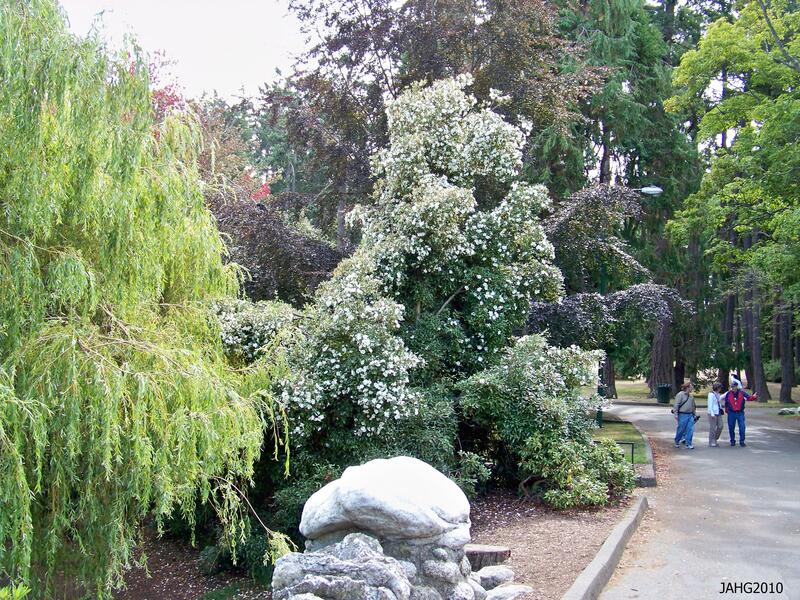 The large Eucryphia found at Dominion Brook Park in North Saanich is Eucryphia x nymanensis and was planted in 1958. 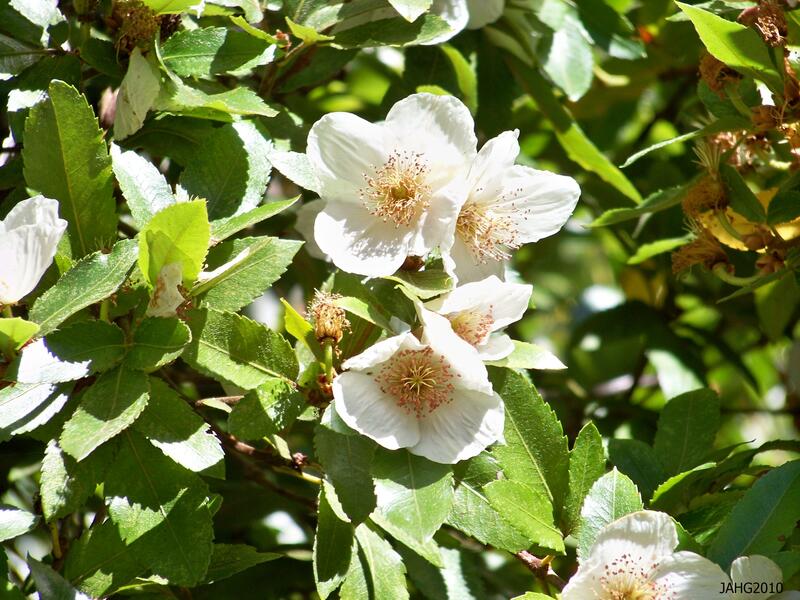 Another easily found Eucryphia is located in Beacon Hill Park by the Stone Bridge which crosses Goodacre Lake. It appears to be Eucryphia x intermedia ‘Rostrevor’. Eucyrphia x intermedia ‘Rostrevor’ is another plant from the ’emerald island’ but was discovered in a garden at Rostrevor,County Down, Northern Ireland. It was found in the 1930s. It is a cross of Chilean species glutinosa and Australian lucida. 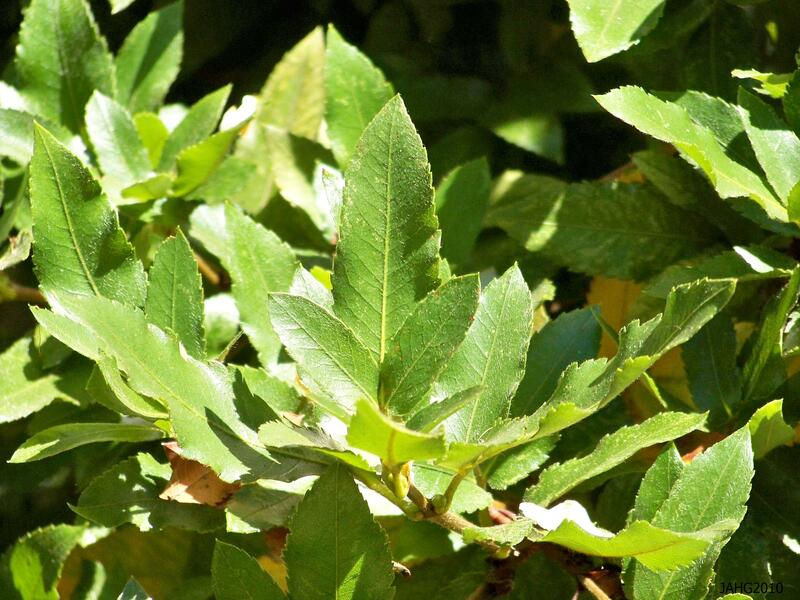 The leaves are slightly toothed or not at all and have overall shiny, smooth look. 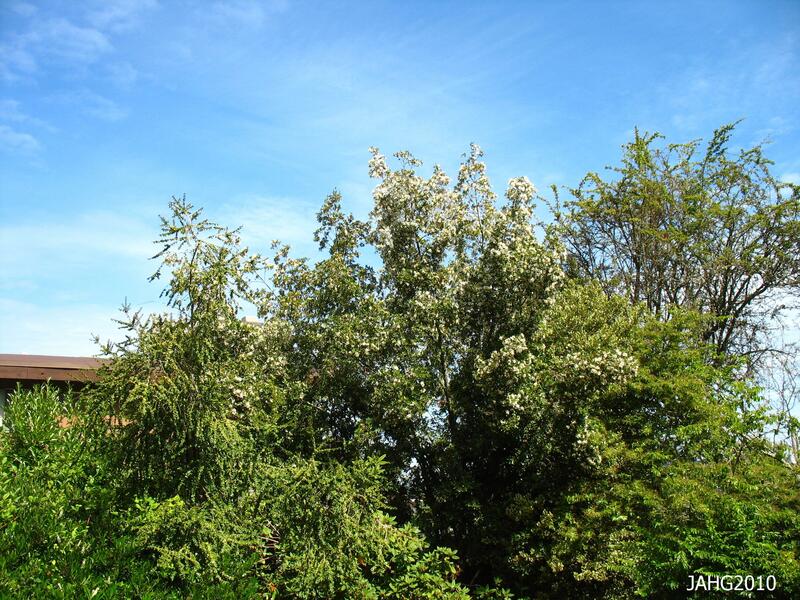 It is a smaller, more elegant small tree or shrub which has a narrower profile. It too is considered to be very hardy. The leaves of Eucryphia x intermedia 'Rostrevor' are smooth and glossy. Here on Vancouver Island Eucryphias are seen in some of the more important plant collections public and private. I have also seen them at Government House, Finnerty Gardens and farther up the island at Milner Gardens at Qualicum Beach. The most commonly seen form is ‘Rostrevor’ although I know that several of the species are grown in private collections which can ocasionally be seen by the public. Eucryphias grow very well in the mild marine climate here. This huge Eucryphia x nymanensis is found at Dominion Brook Park in North Saanich. Eucryphias re at home in a woodland setting and other slightly shading plants. They are naturally a specimen in the garden at this time of year but also make an attractive accent in many settings such as a shrub or perennial border. Here they grow in a marine setting where the damp of the air helps them in drier times of the year. Some Eucryphia are highly fragrant and also are good sources of honey for bees at this late time of the year. In fact the South American species have in the past been used as a commercial source of honey.